Sandwich Town Beach was empty at low tide on a winter afternoon when scientist Mary Carman yanked on hip boots and waded among the eel grass and barnacles, her brown eyes scanning the clear water. Spotting a butter-colored mass on a rock, she rolled up her jacket sleeve and plunged in her bare hand. Out came something resembling soggy scrambled eggs. “Alien vomit, that’s what kids call it,” Carman said. In fact, the cold, rubbery animal was a troublesome species of sea squirt that likely invaded the New England coast from Asia or Europe in the early 1990s. Lacking natural predators, it is now found along the coast from Connecticut to Maine, as well as offshore at valued fisheries on Georges Bank, where dense mats of sea squirts are found in a 40-square-mile area of seafloor. At an international conference April 21-22, 2005, sponsored in part by the Ocean Life Institute at Woods Hole Oceanographic Institution (WHOI), scientists and natural resource managers will address how—and if—they can keep the invasive sea squirt population in check. While invasive sea squirts won’t harm people, scientists worry about effects on marine life. Evidence shows that sea squirts smother scallops and mussels, push out native species of sea squirts, and coat the seafloor, possibly making areas uninhabitable to fish eggs and shellfish larvae. “Anyone who likes to eat seafood should worry about this,” Carman said. Scientists suspect the sea squirt hitched a ride in water used as ballast on cargo ships, or on imported shellfish used in the aquaculture industry. 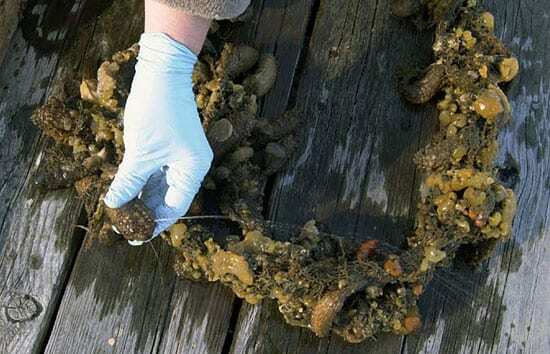 Like green crabs, kudzu, gypsy moths, purple loosestrife, and tens of thousands of other non-native animals, plants, insects, and microbes that have settled in the United States over the last several centuries, the sea squirt invasion could have potential ecological and financial impacts, scientists fear. The damages and control costs related to all invading species in the U.S. are estimated at $137 billion per year, according to a study by Cornell University ecology and agricultural sciences professor David Pimentel. Costs associated with sea squirts are not yet known, but among the more notorious examples of damages caused by an invasive species are zebra mussels, which have spread to nearly two dozen states since the 1980s. They often outcompete and overwhelm native species, and block water intake pipes that cost tens of millions per year to repair. Sea squirts are tunicates, a type of sea life with a firm, rubbery outer covering called a “tunic,” from which the name derives. Of the nine types of sea squirts found on Cape Cod, six are invasive species. Carman focuses her research on a species of the genus Didemnum, which forms dense mats made from many small, linked individuals. At the Sandwich tide pool, Carman showed how it kills. Wiggling her finger into a sea squirt’s wrinkly folds, she pointed out shellfish trapped within. Like a creature from a horror movie, the sea squirt had spread up and around a rock, smothering everything in its path, including shellfish. Carman initially encountered the animal seven summers ago as a naturalist teaching youth education programs on Cape Cod. “It was difficult to avoid them,” she said. “Tons of them were on the docks, on pilings, in tide pools, looking like dead brain tissue.” In tide pools and rocky sea beds, they often form wide, lumpy mats. On docks, lines, and boat hulls, they grow pale, stringy stands, like multi-armed octopi. Kids peppered her with questions about this odd creature, and she quickly learned that scientists had no ready answers. She began work in the Geology & Geophysics Department at WHOI and acquired funding from USGS, WHOI, and WHOI Sea Grant. “What started as a hobby has turned into a full-fledged research project,” said Carman, who has a degree in paleontology and previously studied microscopic invertebrate fossils at The Field Museum in Chicago. In December 2003, she began working on field studies with research geologist Page Valentine of the USGS in Woods Hole. At least once each month, they venture to the Sandwich Town Beach for research. Their experiments include snipping sea squirts and moving portions to isolated, contained areas of the tide pool to see how they reproduce and grow (they do—and quickly—the scientists have learned). The scientists also observe if predators feed on sea squirts (only periwinkle snails, and only if the sea squirts are dead). “Invasive sea squirts do present a problem, but we’re figuring out some things we could do,” Valentine said. At Georges Bank, for example, strategies could involve keeping fishing gear away from the sea squirts, to avoid dragging them to unaffected areas. On shore, a different approach may be needed. Sea squirts do not survive long when exposed to air, so Valentine and Carman are studying how mussel and oyster farmers may be able to stymie sea squirt growth by drying out equipment that could host the organism. 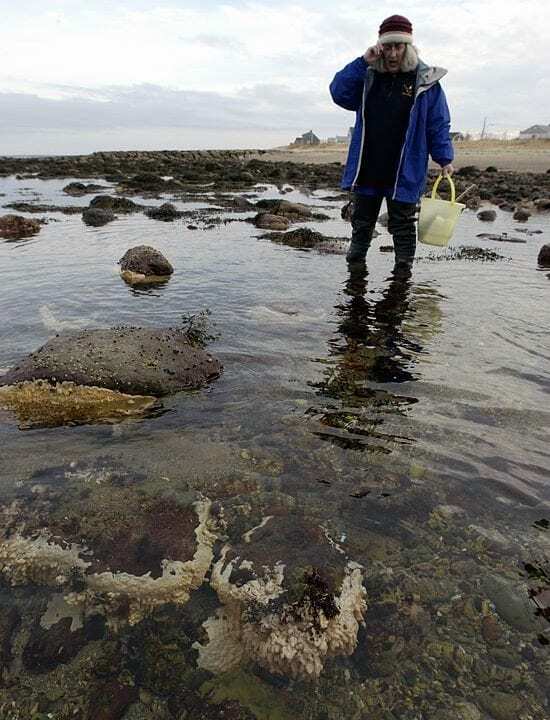 Preventing sea squirts from entering new areas may be the best solution, said Judy Pederson, manager of the MIT Sea Grant Center for Coastal Resources. For April’s international sea squirt conference at WHOI, Carman said she’s expecting at least 40 speakers and 100 attendees, including scientists from the western United States, Canada, Brazil, New Zealand, India, Denmark, Spain, and the Netherlands. Coastal communities in these regions are also dealing with invasive sea squirts, she said. For all the headaches that invasive sea squirts can cause, native species are valuable. Some people use them for fishing baits. Scientists use them for genetics research and are exploring them for chemicals that could treat cancer. In nature, sea squirts filter water, keeping it clear. Sea squirt waste is a food source for other marine organisms.